“Reduce, Reuse, Recycle” — we’ve all heard the phrase, but not all of us know what each of those steps can entail, particularly recycling and the rules behind it. Consumers often have trouble determining recyclability of a few specific items – items like sheet plastics, batteries, compact fluorescent lights – and opt instead to throw those items away. However, by keeping in mind the requirements and limitations of recycling facilities, everyone can help to reduce the volume of recyclables heading to landfills and improve our collective impact on the planet. Some products are both hazardous for regular trash collection and more difficult to recycle than setting them in the curbside recycling. This is true for both batteries and bulbs. Most batteries produce energy through chemical processes, and the remaining traces of those chemicals can leach into the environment when sent to the landfill. Recycling batteries is simple; they need only be separately bagged and dropped off or shipped to collection facilities. One can use search programs such as Call2Recycle or Earth911 to find nearby collection facilities like auto parts stores and electronics stores. One may also opt to mail in their recyclable batteries to accepting programs like Call2Recycle’s, which sells kits that customers may then fill with batteries and ship to the facility using the provided return labels. 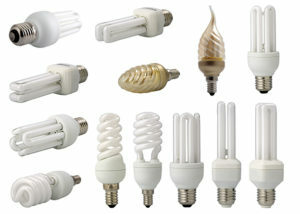 Compact fluorescent lights (CFLs) and other fluorescent lights are notable products in need of proper recycling and handling. CFLs and fluorescent lights contain trace amounts of mercury, which can be harmful in the case of a broken bulb (Broken fluorescent light? See here for the Environmental Protection Agency’s recommendations on cleanup and disposal). Should your bulb break, it may be disposed of, as it is no longer recyclable. However, an intact bulb is almost 100% recyclable and can be accepted at local facilities and hardware stores. Some states (California, Maine, Massachusetts, Minnesota, New Hampshire, Vermont, Washington) even require consumers to recycle fluorescent bulbs. Recycling plastics can be a little tricky for the average consumer. Plastics are divided into seven categories, called resin identification codes. Each resin type has different properties that make it a more viable material for some products and less so for other products. Properties such as strength, flexibility, permeability, and surface clarity are all considered when selecting a resin type for a product. Listed below are the different resin types and some of their common uses. These codes help only to define the type of resin or plastic that product is made of, meaning you can’t depend solely on the codes to determine recyclability. Movements in the recycling industries have produced organizations, such as the non-profit How2Recycle, that aim to reduce the guesswork and streamline recycling for all customers. For now, however, it’s important to stay on the safe side and know where your plastics are coming from and going to. Most plastics that a consumer might use are recyclable. That said, they cannot all be recycled in the same way or place. All plastics must be fully cleaned and dried before being sent to a recycling facility – even a few drops of soda or a spoonful of yogurt can contaminate an entire bale, or thousands of pounds, of recyclable materials (that means every pound of that several-ton collection will head straight for a landfill). Even materials that have been properly cleaned can contaminate or disrupt recycling processes; for example, recycling plastic grocery bags in the curbside bin can lead to clogging of sorting machinery, sometimes disabling a sorting plant for an entire day. 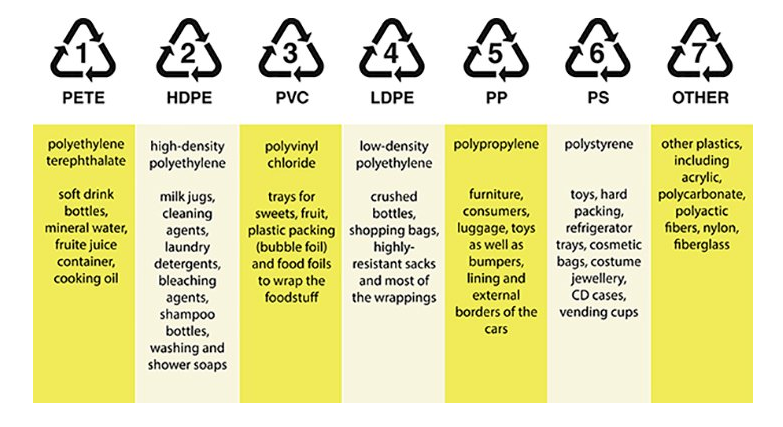 Rigid plastics – plastics like bottles, jars, and containers – are generally recyclable, with the exception of type #7 plastics. 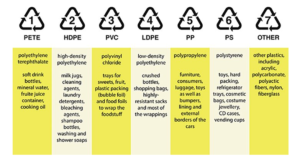 Type #7 plastics consist of a blended mixture or layers of different resin types, and most facilities don’t have the means of separating and recycling the different resins. Flexible, or thin film, plastics can be a totally different ballpark. These products range anywhere from inflated shipping packaging to grocery bags, newspaper bags to product wrapping on household items, cereal box liners to bubble wrap and much, much more. Typically, these items are not accepted in curbside recycling and can even contaminate the entire load. Various facilities like grocery stores and mail centers will accept these items, but it’s important to research which may suit your needs beforehand. One can sort by categories like cardboard, light bulbs, mixed paper, metals, rigid plastics, flexible plastics, electronics, batteries and compost. Sorting your materials helps to eliminate contamination and can also help to streamline the receiving facility’s processes. Prepare your materials for processing. This means rinsing and drying all containers and deflating any packaging plastics. Some people are surprised to find that greasy pizza boxes or egg cartons with shells stuck inside are in fact not recyclable and can contaminate an entire load of recyclables. Don’t leave sauce in the jar or leftovers in your takeout container! For example, most plastic containers can go in your curbside bin, but grocery bags are only accepted at participating facilities, like your nearby market. Five minutes of researching your local facilities can help to eliminate contamination issues! Some websites host search engines that can tell you exactly where you can recycle any item – a good example being Earth911. Reduce and reuse come first. Remember – even if everyone recycled everything possible, the processes required for producing those products would still have a negative impact on our environments. It’s important to first and foremost reduce the amount of single-use or “junk” products we purchase, reuse the products we do purchase, and recycle what remains. If you would like more information on how to make your home or office more eco-friendly, please visit our website and reach out. Sustainable Investment Group provides Leadership in Energy & Environmental Design (LEED) consulting, LEED Exam Prep Training, Green Building Consulting and Technical services from our offices in Atlanta, GA; Boulder, CO; Minneapolis, MN; New York, NY and San Francisco, CA. © 2019 Sustainable Investment Group (SIG). All rights reserved.